The summer of 1986 was one to remember. I was fifteen years old and the World Exposition had taken over a large chunk of prime waterfront land in downtown Vancouver. My dear friend, J. and I clambered on the bus whenever we could, Expo passes clutched in our hands, filled with anticipation of our day exploring the international venues, sampling various foods (waffles, crepes, curries), and checking out any cute teenaged boys that wandered across our paths. Come on, we were fifteen. That’s what teenaged girls do. And besides, we were just doing our part to promote international diplomacy. To this day, because J. and I are still close friends, we joke about the various names we gave to the unsuspecting objects of our admiration – “black tank top boy” and “red baseball cap boy” were at the top of our discerning list. As we often craved something sweet during our adventures, the French pavilion became one of our favorite haunts. No matter what time of day we visited, we found the chefs diligently filling any number of thin, tender pancakes with a range of savory and sweet fillings. 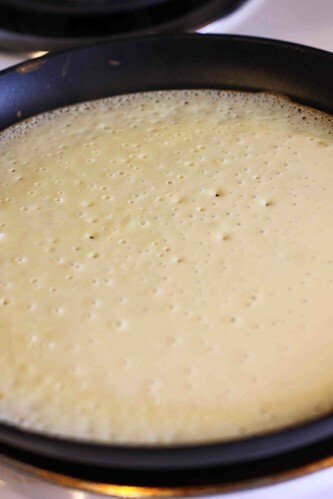 As the crepe batter hit the large, circular cast-iron griddle, it sizzled and bubbled to form a paper-thin wrap. Spoonfuls of strawberry or blackberry cream filling, or spatulas laden with creamy Nutella were smeared onto the crepes, which were then quickly rolled into thin batons. Our first bites were always taken in reverential silence, as our lips wrapped around the still-warm crepes and our teeth sank through the sweet, soft filling. While crepes are often thought of as a dessert or sweet breakfast treat, they work beautifully as a savory brunch or dinner dish. 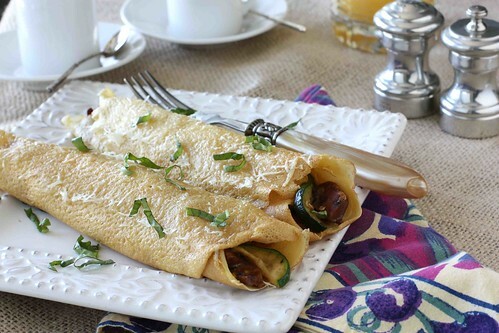 Whether filling them with leftovers, such as ham and asparagus, or conjuring up a mixture of gourmet sausages, zucchini, and mascarpone cheese, crepes are a surprisingly easy meal because the they can be made ahead. When wrapped in plastic wrap and placed in a ziploc bag, crepes can be refrigerated for up to three days or frozen for up to two months. When ready to use, let the crepes defrost at room temperature, remove the plastic wrap, and wrap the pile of crepes in aluminum foil. Place in a 325 degree F oven for 10 to 15 minutes, then separate and fill the crepes. 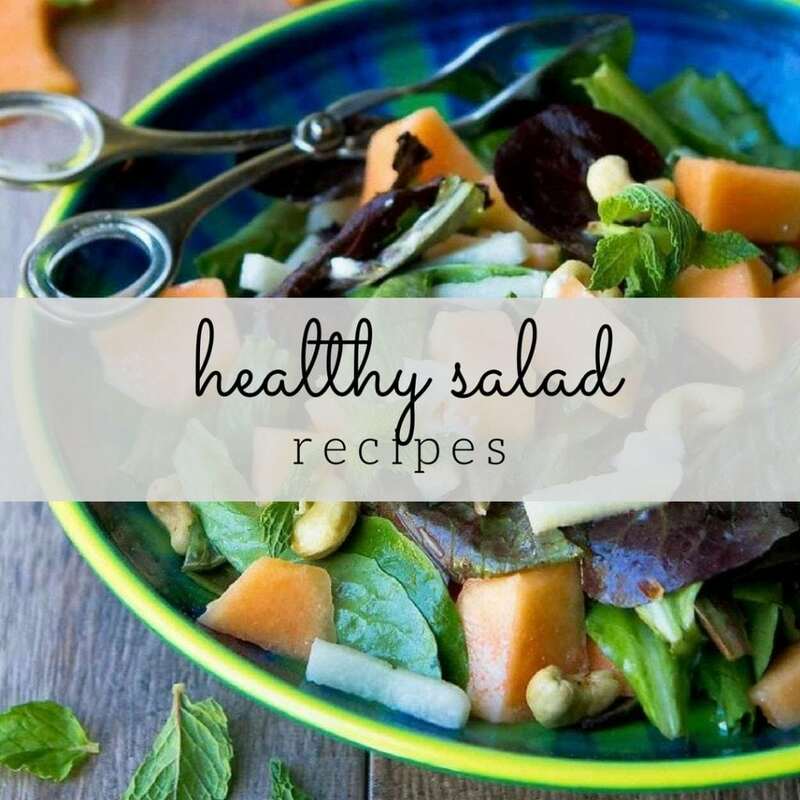 In this recipe, I used a mixture of chickpea (garbanzo bean), which can be found in health food and Indian food stores, and all-purpose flours. If you prefer to leave out the chickpea flour, use a total of 1 cup of all-purpose flour. 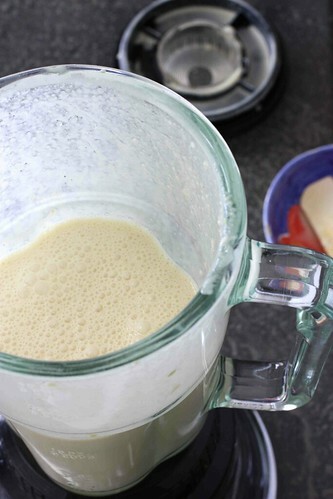 In a blender, combine eggs, flours, milk, water, salt, and melted butter. Puree for about 10 seconds. Scrape down sides, then puree for additional 15 to 20 seconds, or until mixture is smooth. Cover and refrigerate for at least 1 hour and up to 24 hours. Remove the crepe batter from the fridge and stir. Heat a 9- or 10-inch nonstick crepe pan over medium-high heat. Lift the pan from the heat, pour 1/4 cup crepe batter onto the pan in a circular motion, and swirl to evenly coat the pan. Place the pan back on the heat and cook until the center of the crepe is almost dry and the edges are lightly browned. Using a spatula, flip the crepe and cook for additional 15 seconds. Remove from the pan, and place on a clean kitchen towel. Repeat with the remaining batter until there are 8 crepes. Heat olive oil in a large skillet set over medium-high heat. Add shallots and cook, stirring, for 1 minute. Add sausages and cook, stirring occasionally, until sausages start to brown. Add zucchini slices and cook until they are just tender. Remove from heat and let cool for 5 minutes. In a medium bowl, stir together mascarpone cheese and egg until combined. 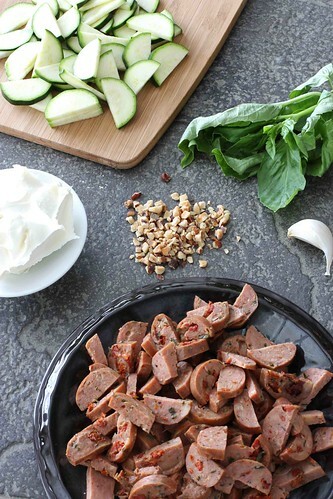 Stir in sausage mixture, basil, and hazelnuts. Using 8 crepes, arrange 1/3 cup filling down the center of each crepe. Roll and lay side-by-side in a greased 9- by 13-inch baking dish. Brush the tops of the crepes with 1 tablespoon olive oil and sprinkle Parmesan cheese over top. Bake until the crepes are heated through, 10 to 15 minutes. Serve immediately. 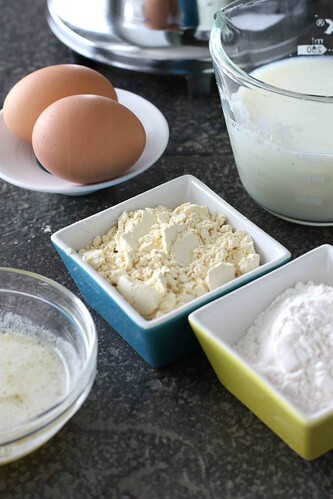 In a blender, combine eggs, flours, milk, water, salt, and melted butter. Puree for about 10 seconds. Scrape down sides, then puree for additional 15 to 20 seconds, or until mixture is smooth. Remove the crepe batter from the fridge and stir. Heat a 9- or 10-inch nonstick crepe pan over medium-high heat. Lift the pan from the heat, pour 1/4 cup crepe batter onto the pan in a circular motion, and swirl to evenly coat the pan. Place the pan back on the heat and cook until the center of the crepe is almost dry and the edges are lightly browned. Using a spatula, flip the crepe and cook for additional 15 seconds. Remove from the pan, and place on a clean kitchen towel. Repeat with the remaining batter until there are 8 crepes. Heat 1 tablespoon olive oil in a large skillet set over medium-high heat. Add shallots and cook, stirring, for 1 minute. Add sausages and cook, stirring occasionally, until sausages start to brown. Add zucchini slices and cook until they are just tender. Remove from heat and let cool for 5 minutes. Serves 4 (2 crepes per serving). While the warm crepes with Grand Marnier or Nutella remind me so much of my months in Paris after high school, I dare say my favourite crepes were filled with caramelized apples – it was the first thing I ever cooked for my now partner in crime. Such a warm and delicious thing to make for someone be it sweet or savory. In fact, I may just have to make some tomorrow…. mmmmm crepe goodness. CC…I love savoury crepes and yours look good. I am sure your family loves them too….once again I wish I was just next door 🙂 for the time being I shall just drool and feast on them virtually 🙂 Thanks CC for the wonderful recipe. Have bookmarked this ! Mmmm…I would love this for breakfast. Looks very delicious. 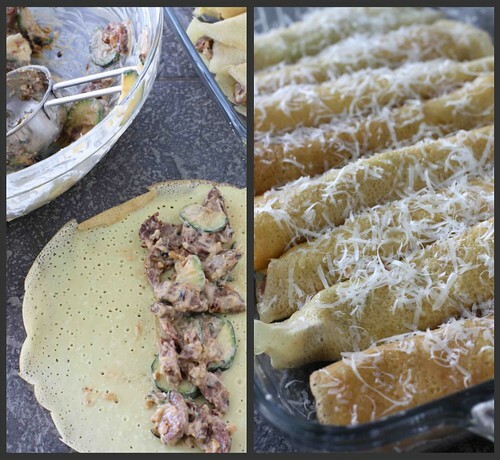 I love making crepes but, frankly, my experience has been limited to the savory kind, like the ham and asparagus filled you mention or spinach and chicken, and my favorite — cannelonni. 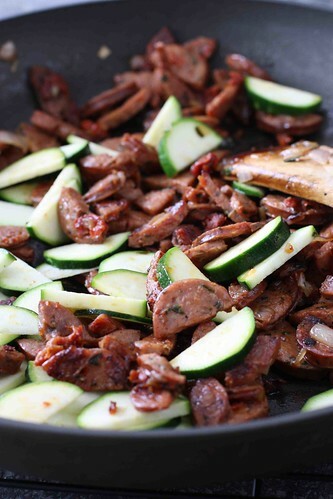 I love the idea of sausage and zucchini!I'll have to try sweet, too. I happen to have some Nutella . . . Your professional photo's are just to marval at, the food looks wonderful the refcipes is awesome! I have numerous stories like the one you've shared. Teen girls and their boy crazies! Haha! But then again even into my early twenties I was still boy crazy. Now that I think about it… I'm still boy crazy for my guy and my itty bitty! I don't think it will ever get out of my system. Those crepes look and sound incredible! I have never had a crepe and want to try them. Needing to add that to my list of "need to make!" My hubster walked my while I was reading this post. I am now committed to making these! He's awfully excited about them…so much so that he may actually end up making them before I do (which definitely works for me)! Thanks!! love that sausage… this dish and the previous meatball one is a toss up – both are so darn good sounding and inviting…. I love crepes and it's so great to see them this way. Fabulous! Wow my mouth is watering…. great pics! Now I think I want crepes for lunch… lucking there's a French takeout place nearby! This looks delicious! 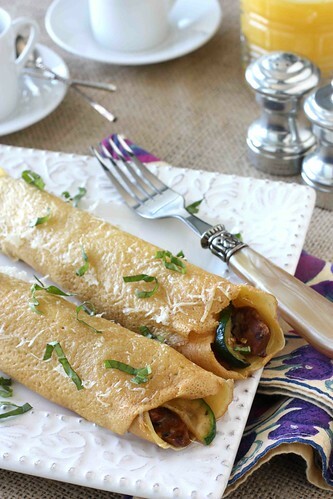 I usually always make sweet crepes but I love this idea for savory crepes. 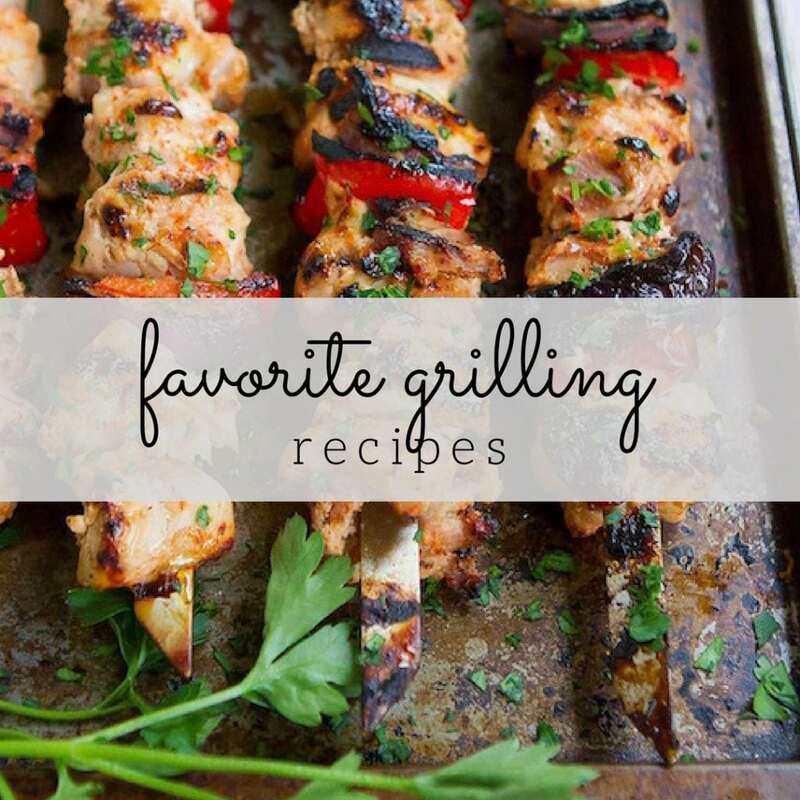 Your photos are beautiful and are making my mouth water! Once I saw there was sausage involved this recipe got very interesting for me. I love sausages! Great tip about making the crepes ahead of time. They always take so long to prepare! Whoa!!!!! Baked crepes – love them!! Fun to have food memories like that. I've only ever had sweet crepes, so I'll have to try these savory ones! Looks great! Oohh!!! I am excited about these!! I have never had anything but a sweet crepe, and while I like them, this is something that I would love. I've not worked with the garbonzo bean flour, but had seen it at the store. Actually had it in my had but didn't know what I'd do with it! 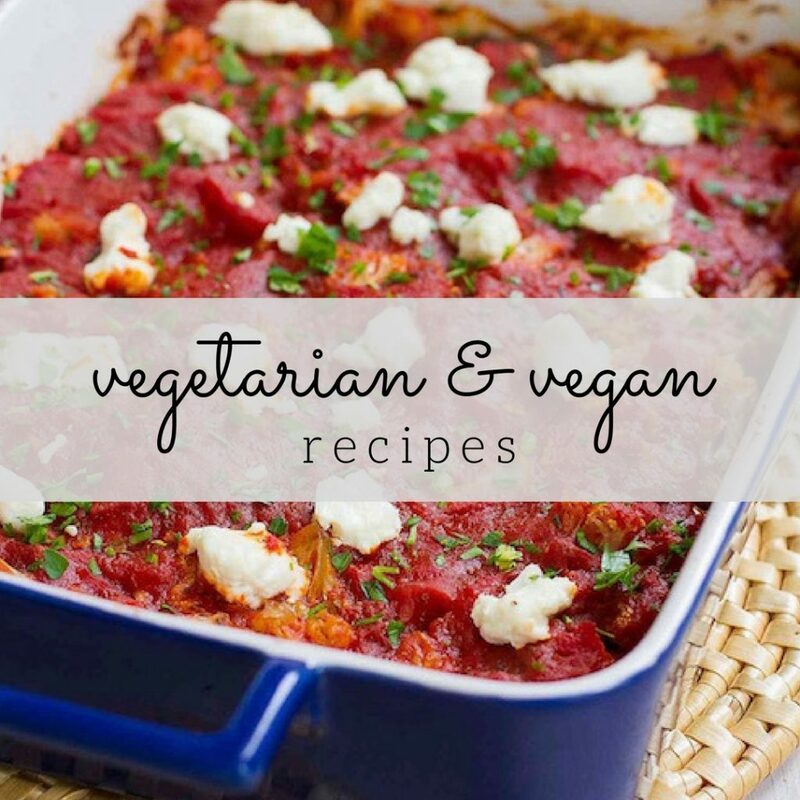 Thank you for this recipe, I'm really eager to try! What a lovely brunch that would make. I adore crepes of all sorts. These crepes look wonderful. I have never thought to bake crepes but I love how cheesy and crisp they look. And since making crepes one by one for a crowd is a challenge, this is such a great idea!